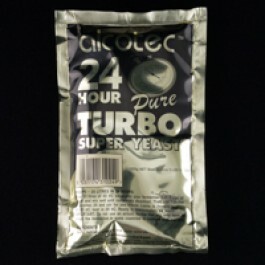 Alcotec 24-Hour Turbo Yeast is a mixture of dry distiller’s yeast and yeast nutrients designed for super-fast fermentations that produce high alcohol content. The recipes included with the 205 g package produce 25 liters with 13-14% ABV in just 24 hours. The actual fermentation looks like nothing you have seen before in home brew, it is more of an explosion. For making alcohol, there is nothing faster.